Chad Mann, a recent graduate of the University of Utah and president of MannMade Innovations, led his team into the top-4 of the 2014 Utah Tech Week Hackathon this fall. In just a matter of hours, Mann and his team designed an “internet of things” device to remotely track one’s health.“It was nothing short of impressive to see what all of these top-level development companies were able to develop … in only 9 hours,” Mann said.Mann is an alumnus from the College of Engineering, David Eccles School of Business Professional Master of Business Administration and Lassonde Entrepreneur Institute programs. 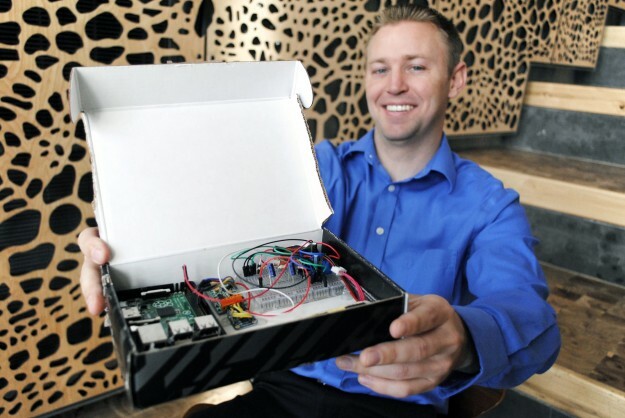 While attending the U, Mann served as a student director for the Lassonde Institute and his startup Short Solutions won the $40,000 grand prize of the Utah Entrepreneur Challenge.The device Mann and his team developed for the hackathon employed light waves and an infrared sensor to monitor blood flow, pulse rate and other critical information. A Linux-based wireless chip-set was used to stream the information over the Internet in real-time. The team also developed the complimentary server platform and mobile app to monitor the data.More than 20 teams competed in the hackathon on Oct. 7. To begin the competition, the teams were given spare parts to use in their hardware development. They were also given the challenge to develop a system that “makes life easier.” The teams spent the day focused on developing their projects for the final presentation. Later that night, each of the teams had a chance to present their projects in 3 minutes to a panel of expert judges. At the conclusion of the event, MannMade was announced among the top-4 teams with Vivint Solar, Instructure, and Experticity.Mann’s team was then invited to present at the Utah Showcase held at The Depot in downtown Salt Lake City in front of investors and technology authorities. More than 1,300 people from 21 states and 3 countries attended the Utah Tech Week events. After graduation, Chad formed MannMade, a leading design firm providing product development services. They specialize in embedded systems, such as Internet connected devices. For more information, go to www.mannmadeinnovations.com. More information on the 2014 Utah Tech Week can be found at siliconslopes.com/2014/10/utah-tech-week-recap/.